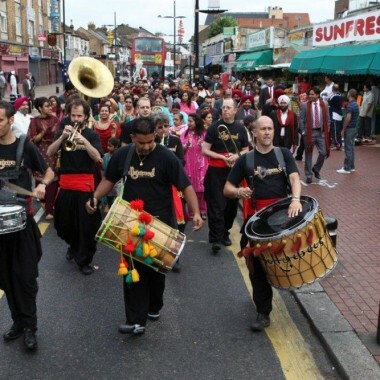 Marching Bollywood band for hire. 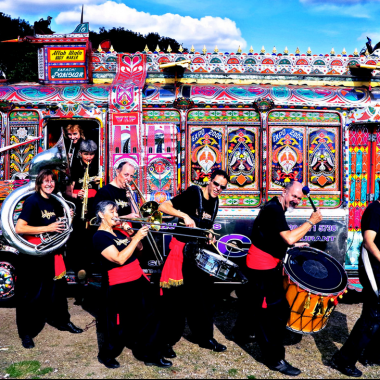 The Bollywood Brass Band are 4 funky drummers and a hot 6-piece horn section, all driven by the huge beat of the dhol drum. The result is one of the most colourful, joyful and exhilarating acts in the world. 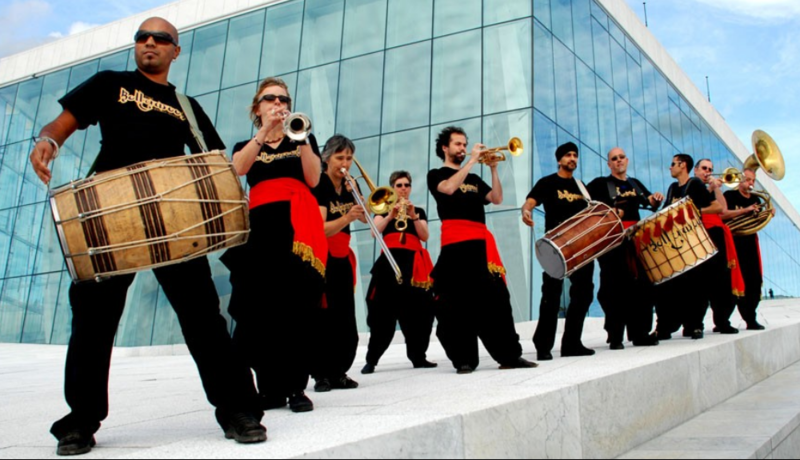 Bollywood Brass Band is the UK’s pioneering 10-piece Indian-style wedding band, playing the great tunes and compulsively danceable rhythms of Bollywood. Repertoire covers classics from the Golden Age of Bollywood up to current hits and stage shows can feature Bollywood film clips or a dancer to get your audience up and dancing. 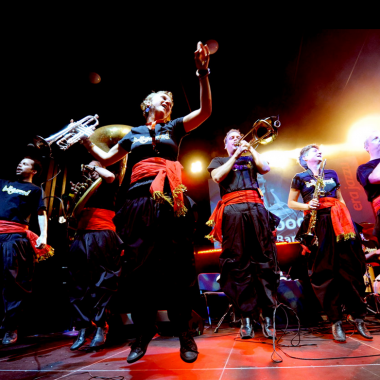 With brass, saxophone, dhol drums and a colossal sousaphone, the BBB is one of the most colourful, joyful and exhilarating acts around. 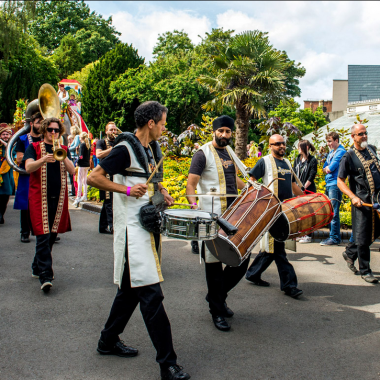 Colourful and exciting marching band of Dhol drummers and strident brass instruments, the BBB have led many a street parade all over Europe. Their roots are in the wedding and street parade scene, and they’ve remained very true to that, although these days they also play a lot of festivals in the summer. 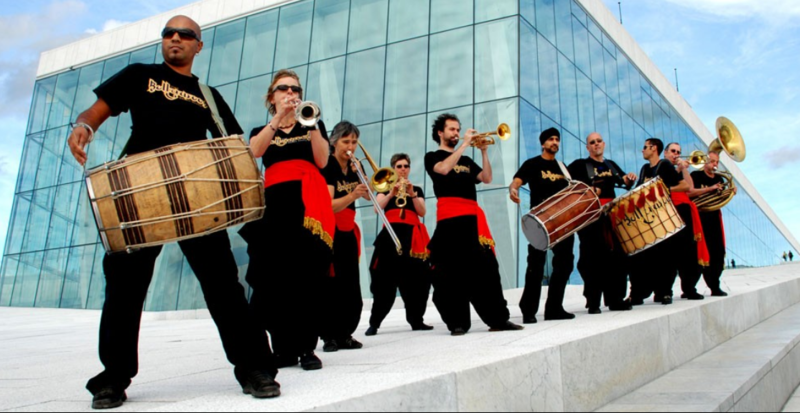 Back in ‘92, as they were taking shape, they began with a Bollywood repertoire from the Shyam Brass Band, and over the years they’ve added to it, bringing in some Bhangra and pieces by the late Nusrat Fateh Ali Khan, in addition to focusing heavily on the work of film composer A.R. Rahman.